In our house we like math games, that make learning how to count, add and times table fun! 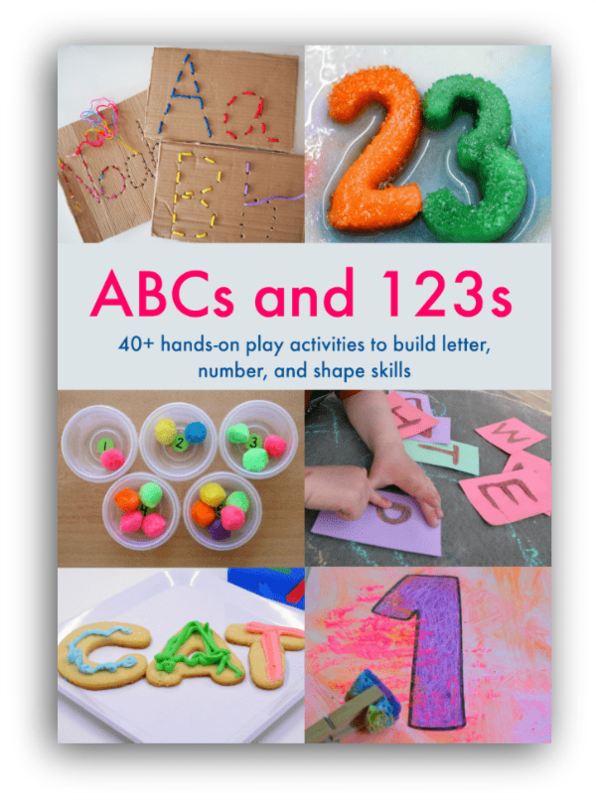 We also love colour, art, patterns and pictures, so these stamping activities are a great way to create and enjoy whilst working on important math principles. Here’s how we took over the kitchen table with some stamping patterns. All you need for these math games are a big piece of paper, a few stamps, and ink pad and maybe a pencil or two. 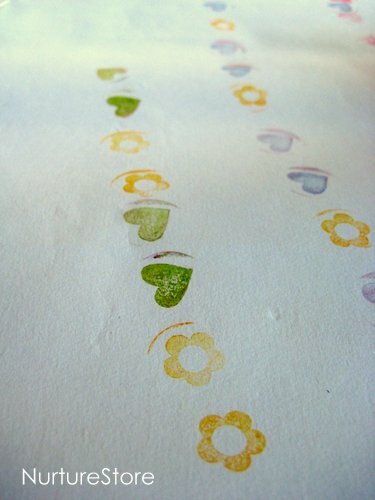 We set out a long roll of plain paper on the kitchen table and set about stamping and patterning to cover it all. 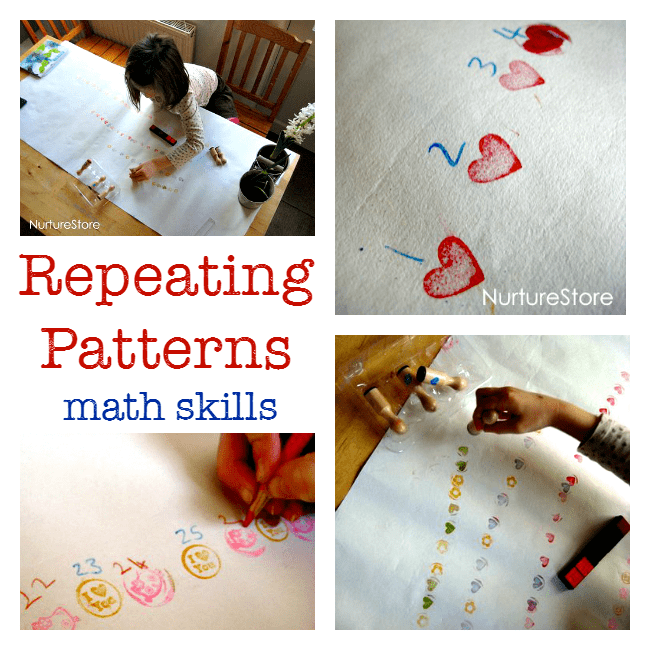 The idea of these math games is to make repeating patterns with the stamps. These patterns are great for thinking about maths as the patterns pop up in all sorts of places when we start to do sums and work with numbers. 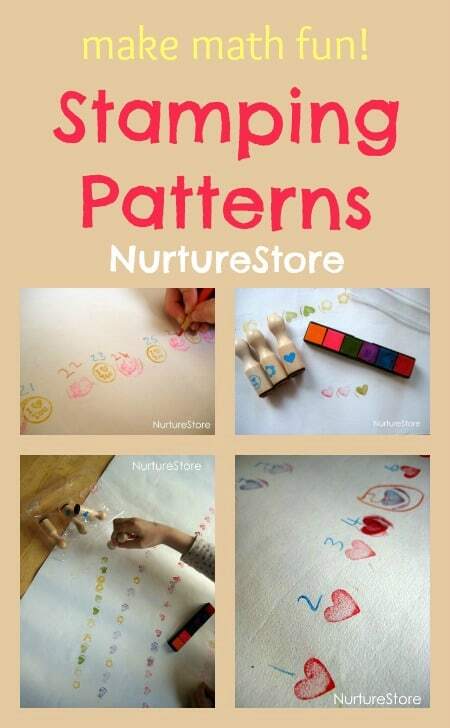 They’re like a language of maths and underpin a lot of later learning, and enjoying playing about with the colour, shape and feel of these repeating patterns using the stamps is a very simple and fun way for children to explore the concepts. And you can vary your math games depending on the age and stage of the child who’s playing. 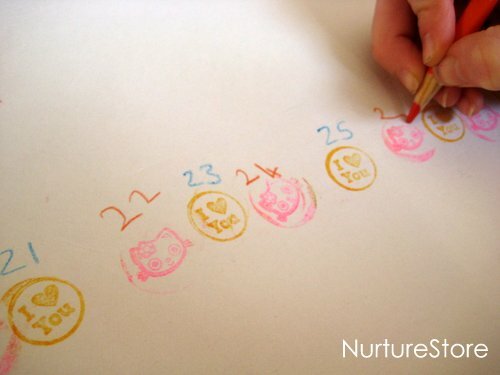 First of all, just enjoy stamping and let your child make their mark. 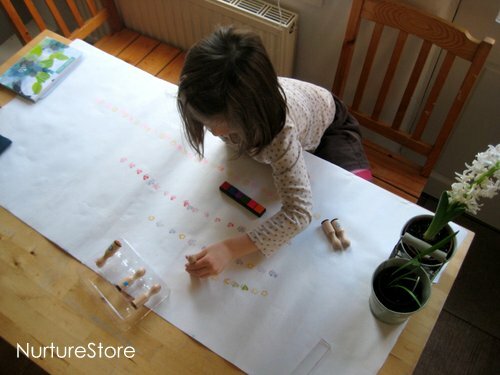 Then you might like to set out a simple repeating pattern and see if they’d like to copy and continue the pattern as far across the table as they can. 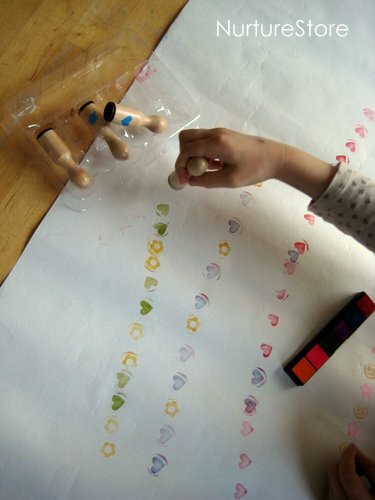 An ABABAB is a good place to start: flower stamp, heart stamp, flower stamp, heart stamp…….. just like the pattern of odd and even numbers. Let your child set you some invitation patterns that you have to follow. We also love using our bodies to clap, stamp and jump out the patterns we’d made. Hop, hop, clap, hop, hop, clap…. You might like to write in some numbers along your pattern, perhaps taking it in turns. 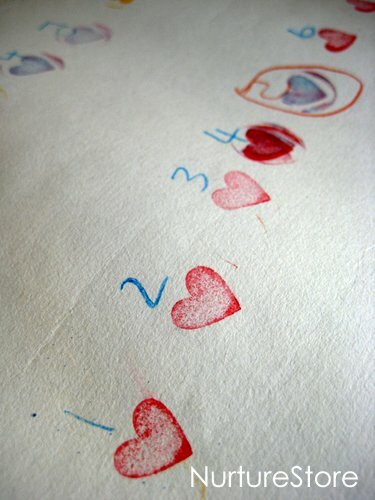 You’ll see in the photo above all the ‘I ♥ You’ stamps turned out to be odd numbers – every single one. Clever! It’s also a good way for children to see the pattern in their times tables. Above you’ll see we used an AAAAB pattern: red heart, red heart, red heart, red heart, blue heart. When we added the numbers in we discovered our five times table along all the blue hearts. See my full index of math activities here. And don’t miss my ultimate guide to hands-on math and literacy learning – download your copy here! 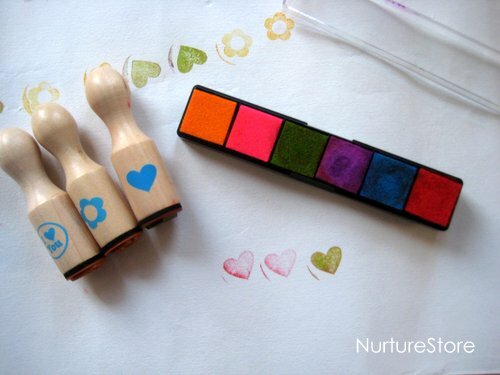 We both love stamping and this looks like a lot of fun. Love the idea, especially the idea of using it to teach times tables. Thanks!